Suwanee, Ga. (July 7, 2015) – Rugged Ridge® today announced the availability of its Exo-Top™ in new expanded applications for two-door 2007-2015 Jeep Wrangler JK. Previously only available for four-door Unlimited models, the two-door Exo-Top™ features the same innovative, industry-first design that combines open air functionality of a soft top with the utility of an integrated roof rack. The Exo-Top™ enables owners to experience their Jeep to its full potential for camping, off-roading, or as part of any outdoor lifestyle byallowing users to conveniently open or remove the Jeep’s soft top with ease without having to unload any gear or cargo from the roof rack. Integrated into the 300-lb. capacity roof rack is an advanced externally suspended soft top design that fastens using a series of Velcro straps along the perimeter bars of the roof rack. The pulling force applied by the Velcro helps to tighten and shape the soft top as well as allow for simple soft top removal and installation. The Exo-Top™ also features a Sun Slider®, which allows the top to slide back with the release of just two clips, providing an open-top experience without having to leave the driver’s seat. As with the four-door model, Rugged Ridge’s two-door Exo-Top™ features a patent-pending design that is a direct bolt-on installation with no drilling required. It is also compatible with most standard rack attachments and accessories in the industry, enabling Jeep owners to utilize the Exo-Top™ with their existing equipment to safely haul any type of gear for outdoor adventures, including bicycles, skis, snowboards and kayaks. The Rugged Ridge Exo-Top™ is now available purchase from authorized retailers online and worldwide at an MSRP of $1,600.99 for two door JK Wrangler applications, and at a$1,733.99 MSRP for four-door Unlimited applications. 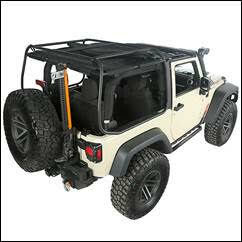 The Exo-Top™ can be seen in action on a JK Wrangler on the Rugged Ridge YouTube Channel. For more information on the Rugged Ridge Exo-Top™, Rugged Ridge’s complete line of high-quality Jeep and off-road products, or to find an approved retailer, please contact Rugged Ridge at 770-614-6101, or visit www.RuggedRidge.com. Omix-ADA®, Inc. is the world’s largest independent manufacturer and wholesaler of Jeep®, truck and off-road parts, accessories and floor liners. For more than two decades, Omix-ADA has designed, tested and manufactured more than 16,000 of the highest quality restoration and replacement parts and accessories. The Omix-ADA family of brands, Rugged Ridge® and Alloy USA®, are distributed throughout the USA and in more than 70 countries worldwide. For more information, please call Omix-ADA, headquartered in Suwanee, GA at 770-614-6101 or visitwww.omix-ada.com.